Due to very popular demand, we continue this range into Spring 2019! 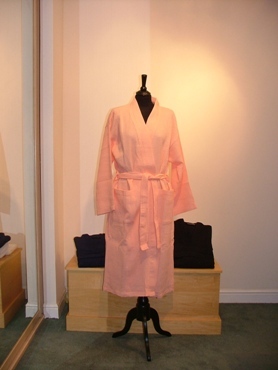 After much nagging from our many happy adult customers, we are now offering our very popular Waffle Cotton Kimono Bathrobe in Children's sizes. From age 1-2 years all the way up to 12-13 years, the crisp, fresh look of lightweight waffle has been replicated in miniature from our adult range. 100% Pure Cotton available in White or Dark Navy Blue. This classic all rounder stays good looking wash after wash and is cute and hardwearing. Perfect for cover up on the beach or ideal for "sleepovers" too!